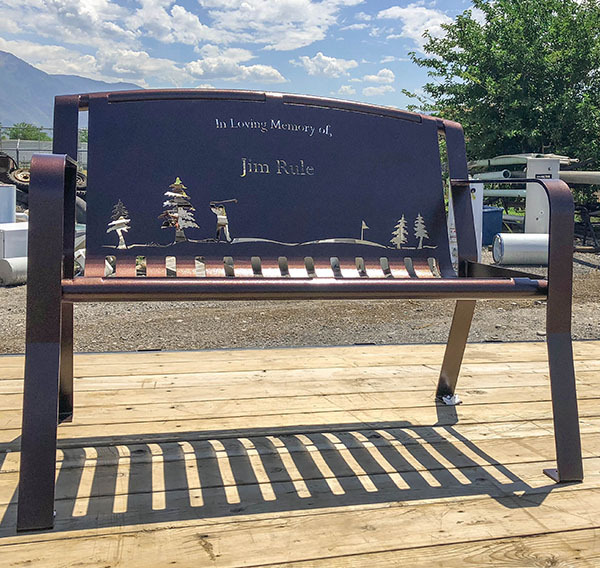 At Smith Steelworks, we manufacture the park memorial bench to honor loved ones that have passed. Our team will walk you through the design process, from start to finish, to create a one-of-a-kind memorial bench. 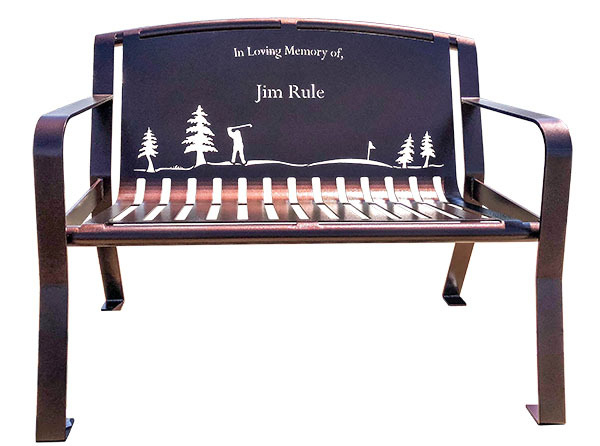 The memorial bench is a beautiful addition to parks, cemeteries, schools, and even golf courses. Send us an email at russelhsmith@gmail.com or call (801) 414-1724 to get started with your order! Add inscriptions, portraits, and sceneries directly into the back of the metal bench. Powder coat is applied to the memorial bench for a durable, rust-resistant finish. The bench is a perfect spot to share stories and memories of your loved one. 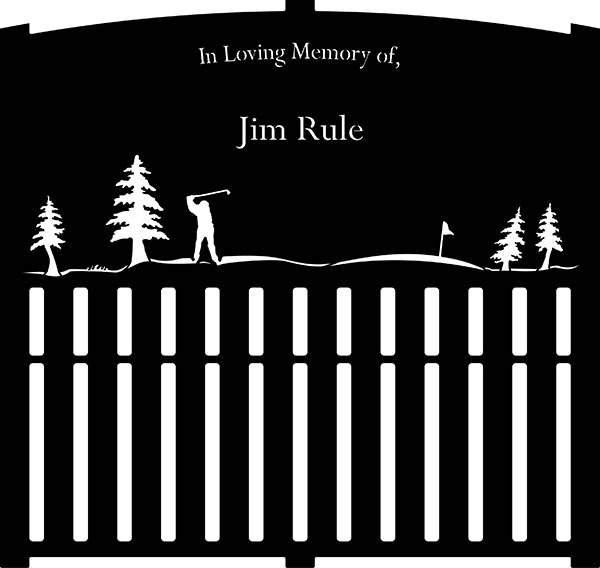 For this bench, it was important to focus on Jim’s love of golf. To accomplish this, a dedicatory inscription and golf scene were added to the bench back. A bench proof was sent for final approval to show how the finished bench would look. The park memorial bench is laser cut from a single sheet of metal and bent into shape. Legs and arms are then welded on. Powder coat is then applied via an electrostatic spray gun. It’s then packaged up and shipped to you. Top notch company, worked with my mom step by step to make a memorial bench for my dad. We had plans on putting it on a golf course. A design picture was made and it was amazing, a golfer, trees, perfect. The bench arrived today at its 2nd to last location and will be set in place soon. Even though I never personally dealt with anyone from here, my mom was so relaxed, filled with joy, and had a sense of relief while dealing with these guys. I want to thank you all for helping her, and us, get though this tough process. Why laser cut? Laser cutting is a manufacturing tool that cuts the metal with a thin laser beam. The laser is precise and capable of making small cuts. This allows our designers to create extremely detailed designs including: portraits, sceneries, special fonts, and more. At Smith Steelworks, our benches are designed to last year after year. Come rain or shine, snow or hail. The memorial bench is designed to withstand harsh weather conditions without sun fade, chips, or rust. Each park bench is powder coated to provide long-lasting color, smooth finish, and weatherproof protection. You can view all our color options here. Classic, Classic Arch, and Metropolitan are our three bench style options. We offer 2′, 4′, 6′, and 8′ bench sizes. The 6′ is our most popular bench size option.